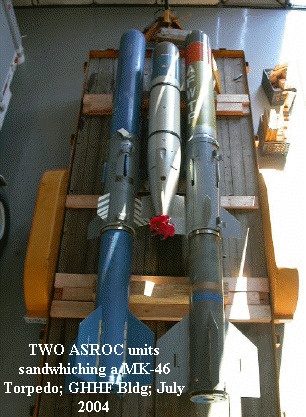 ASROC is a three stage, solid fuel rocket comprised of a rocket motor (MK 12), airframe assembly and a torpedo or depth bomb payload. Length was fifteen feet, missile diameter twelve inches, overall diameter with stabilizing fins thirty inches and weight approximately one thousand pounds. ASROC equipped ships located and tracked submarines with sonar. After target acquisition, data fed from the sonar to the fire control computer tracked the submarine course, range and speed and the ASROC was aimed accordingly. Upon firing the weapon, it flew to a pre determined splash point to deliver the torpedo or depth bomb payload. The torpedo payload was slowed for water entry by a parachute device and the torpedo transducer was protected at water entry by a frangible nose cap. The torpedo's motor then activates and the torpedo, which is guided by its own sonar system, homes in on the target and explodes. (Alternatively, if the missile is instead equipped with a depth charge, it merely sinks to a predetermined depth and then explodes.) 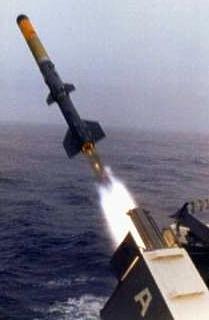 An ASROC missile can carry either a nuclear or conventional explosive, although the nuclear depth charges were phased out by the 1990s. The first ASROC system, using the MK-112 "Matchbox" launcher, was developed in the 1950s and installed in the 1960s. This system was phased out in the 1990s and replaced with a Vertical Launch System and the Vertical Launch ASROC Missle. (See below for details). Early in the 1950’s the Naval Ordnance Test Station (N.O.T.S.) Pasadena, CA, demonstrated the feasibility of projecting a torpedo with a rocket motor to provide an ASW standoff capability for surface ships. This lead to the development of the Rocket Assisted Torpedo (RAT) which utilized a 5" gun mount barrel and the MK 43 Torpedo for surface ship standoff delivery. This program was carried through shipboard evaluation. In the mid 1950s the Naval Ordnance Laboratory at White Oak, MD conducted a study investigating several methods of delivering missile payloads beyond the range capability of RAT. Subsequently the Naval Oceans Systems Center (NOSC) San Diego and N.O.T.S proposed an alternate system be developed called ASROC, and the RAT system developed was terminated. In April of 1956, N.O.T.S. received approval from the Bureau of Ordnance to initiate the development of ASROC and was assigned the role of Technical Director of the weapons system as well design agent of the missile including the adaptation kit, (depth charge less warhead) for the nuclear payload. In August of 1956 CNO (Chief of Naval Operations) promulgated Development Characteristic AS07101-1 which defined the requirement for both a nuclear payload and conventional acoustic homing torpedo delivery capability. The MK 44 Torpedo that was under development at the time was selected as the interim torpedo payload to be eventually replaced by an improved torpedo. Minneapolis Honeywell Regulator Company was selected as the prime contractor with Librascope Division of General Precision selected as subcontractor for the fire control group and the Armaments Division of Universal Match Corporation as subcontractor for the launcher group. The Naval Ordnance Plant, York, PA was selected as the development activity for the launcher power drives. The AN/SQS-23 Sonar, under development by Sangamo Electric for the Bureau of Ships was to be integrated into the ASROC system. The Los Alamos Laboratory was selected to develop the nuclear warhead with Sandia Corporation, Albuquerque, NM. Extensive development testing was conducted on the N.O.T.S. ranges at China Lake, Morris Dam and San Clemente Island. The Navy conducted both independent tests and joint tests with the Atomic Energy Commission (AEC) between 1956 and 1959. In April of 1959 the entire system was brought together and installed on the USS NORFOLK (DL-1). Installation was now complete on a FRAM 1 ship, followed closely by the first of the DDG 2 Class platforms. Installations continued at a rapid rate and the ASROC system population eventually grew to over 200 ships. In 1961 the adaptation of ASROC to the MK 10 (TEROC) Terrier Guided Missile Launching System was initiated and ASROC with the MK 17 Depth Charge payload obtained acceptance for service use. In 1962 a full scale service test of ASROC with the new MK 17 Depth Charge was successfully conducted and in 1963 the MK 114 Fire Control System, a follow on development to replace the MK 111 Fire Control Group was completed and accepted for service use. The MK 46 Mod 1 Torpedo was added as an ASROC payload in 1966 and by 1967 the evaluation of ASROC with the MK 10 Guided Missile Launching System was completed. 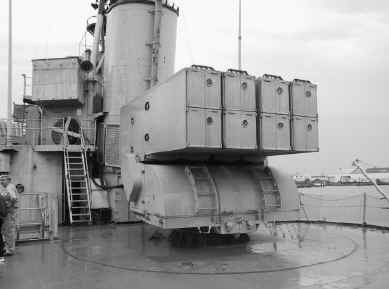 In 1975 the MK 116 Mod 0 Fire Control System and the ASSDROC MK 4 Weapon Handling System was accepted for service use on the DD 963 (SPRUANCE) class destroyers. In 1980 THE MK 116 Mod 1 Fire control System was accepted for service use and integration of ASROC into the MK 26 Guided Missile Launching System was completed. The last installation of ASROC was aboard the TICONDEROGA Class USS THOMAS GATES (CG 51). The ASROC system was phased out of the U.S. Navy in the 1990s in favor of the MK 41 Vertical Launch System and the Vertical ASROC missile.